In our introduction to hydronic heating we learned that a hydronic radiant system uses piping to circulate hot water throughout the home, which allows the heat from the liquid to radiate into the room at a comfortable and consistent temperature. Now we are going to take a closer look at the details of how this hydronic system works. The boiler system uses conduction to quickly and efficiently heat the water. The hot liquid being pumped throughout the house heats the concrete, tile, or other type of flooring through conduction as well as radiates heat into the room. 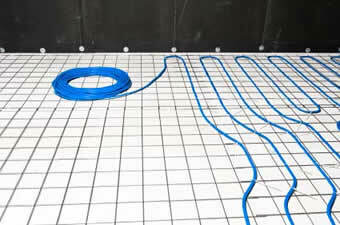 Lastly, the flooring surfaces them radiate the heat they gained from the water into the room as well. The ending result is that a consistent, comfortable temperature radiates from the floor as well as the solid objects around the room. And, a surprising effect is that the radiation of heat in a hydronic system will actually allow you and your family to feel warmer at lower air temperatures than conventional heating. This allows you to further lower your heating bills and energy usage, while increasing your comfort level. With an understanding of hydronic heating and how radiant systems work, we will now take a look at the different types of hydronic systems, so that you can find the one that best fits your needs.